Click the link below for descriptions. Info will be on the episodes page shortly. So it looks like we'll be starting Season 5!!!!!!! And check out the previous new topic for info on SpongeBob Revolution 2.0! Title: SpongeBob Revolution- The Best Day Ever! Leading into SBR 2.0... new content will be held until opening day, with only an occasional update every month. The day SpongeBob Revolution 2.0 is released, all the content will be released and lots more! We'll even put special events on the calendar (I.E. Superhero Day, Arcade Day) when new content will be released on one subject... If there is any content left to release after the BEST DAY EVER!!! That's right! SpongeBob Revolution 2.0 is to be released on the best day ever! What else can we look forward to on the best day ever? There is now a topic in the forums where we will vote on the best episodes in the history of SpongeBob!!! This is different than Nickelodeon's Best Day Ever because we will include every episode that is nominated by the members. Then, we will vote on the best one, and release the top 100 like Nickelodeon did. And on SpongeBob Graphics... Loads of avatars, signatures, etc. will be created based on that episode. You can vote here. We strongly encourage you to request content... So we can make the site better and so we know what to do first. We don't want to screw anything up, so we'll tell you when the Best Day Ever actually is when we are all ready. (Or close to being ready.) You can view a list of what to expect in SpongeBob Revolution 2.0 here. I changed a little bit of the layout and a new skin has been made for the forums. Abney and I will work on more site and forum skins that will match for 2.0. Also, we'readding lots more content to 2.0 right now more than ever. But it's a surprise. And you'll love it. Also, Layouts best in Mozilla Firefox. Tune in on Presidents Day to catch a marathon of Patrick-centric SpongeBob episodes and 3 brand new SpongeBob episodes from 7-8:30pm est. The SpongeBob Revolution 2.0 layout is done! I made it and it has a nice look like the forums. Side includes poll, that'll be changed now and then, picture of the moment (refresh the page and see it change), a log-in form for the forums, and a link code for SBR. The layout also has a nice banner and great drop-down menus. Link to SpongeBob Graphics, which is part of SpongeBob Revolution. Vote in the Poll and enjoy the new skin! King Neptune is totally pwning in the content contest. He'll win if you slackers don't get more content in! BE PREPARED. This is the SBR Era. We will be ahead of SBM soon. So get people to join. Or else!!! I put up a better site layout. Enjoy. Surprise! Check out the capsules page. They're done. Now, I'm moving on to seasons 1 & 3. Abney will do 2. But where's the MermaidMan and BarnacleBoy VI capsule? Fear not! It be coming the day SBR 2.0 is released on superhero day! All the MermaidMan and BarnacleBoy capsules will be done. As for 2.0, I finally have a release date scheduled. I have a simple yet sweet layout for IE, but I need to improve it for Mozilla Firefox users like me. And what I've been telling you it'll include is just the beginning! I'm working on a site map so I can easily conquer 2.0. And also, I can't tell you when it is released, but I can tell you it will be in May. Or sooner. Anyways, the contest winner is King Neptune as of now. but if you donate content, maybe you can beat him. SpongeBob tries out his new magic kit on Squidward and is convinced he's turned his neighbor into an ice cream cone! After a freak bicycling accident, Squidward is coated in so much gunk, he's totally unrecognizable. SpongeBob thinks he's cute and adopts him as a pet. 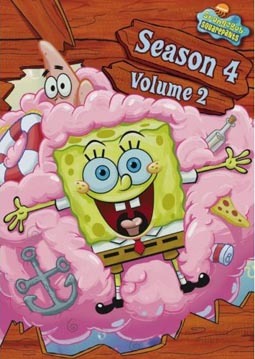 Will you be buying the Season 4 Volume 2 DVD?